Here is the latest For the Birds columns, which runs weekly in several New England newspapers. I don’t typically chase rare birds around the region. It’s not that I don’t want to see the birds, but either family or work obligations usually prohibit me from taking long drives to see a bird. I am often envious of the people who can drop everything, drive eight hours to wherever and look at a cool bird that is not typically seen in New England. But a great gray owl in under four hours? That’s an effort I have to make. It is the largest owl in the world, by length anyway, and its flat, disc face elevates owl coolness to another level. I still had work, however, but couldn’t risk waiting until the weekend should the bird decide to take off and not be found again. So I pulled a maneuver I used to do fairly often before I had kids: I basically pulled an all-nighter. I slept restlessly from midnight to 2:15 a.m. Thursday morning and drove three hours to Keene to pick up my old friend Steve Hooper, of Sentinel photo department fame. Then we drove another 40 minutes to Newport, where this awesome bird had been seen in the same field each day for about a week straight. (I knew that thanks to the ABA rare bird alert.) Hoop and I followed the directions we found online and arrived at the scene at about 6:20 a.m. A rare bird alert message posted at 6:15 a.m. confirmed that the bird was indeed there. Thanks to Dylan Jackson of Sunapee for that update. I was minutes away from seeing my first great gray owl. Let me back up real quickly. Someone saw the bird at 6:15, and I knew about it when I checked my phone at 6:20! Who would have imagined that 20 years ago? Anyway, back to the owl … Steve and I walked a short distance down a trail, saw a handful of people standing in the field and joined the small crowd. Sure enough, there was the owl, sitting in a bare deciduous tree surveying the field and ignoring his fans. After several minutes, the bird flew to another deciduous tree a few dozen yards away. Suddenly it left that perch, hovered for a bit near the treelike and settled into a pine tree — I believe a white pine. I wasn’t in position to get a good shot of it hovering, of course, but what a sight to see the world’s largest owl surrounded by the long, green needles of the evergreen. The occasional snow squall would pass through, adding even more New England character to the awesome scene. But other than the here-again, gone-again snow squalls and a fairly steady wind, it was very pleasant for the owl and its human visitors — especially for New Hampshire in early March. It could have easily been pouring down a cold rain, snowing for real or bitterly cold. As small group of about five of us watched, the owl perched in the evergreen. It seemed comfortable there as it surveyed the field, except when a stiff wind rolled through and wreaked havoc with the pine’s thin branches. The owl held on just fine. I was hoping to see one more flight, but time was short. I had to drop off Hoop and drive the three hours back to southwestern Connecticut to get to work while it was still morning. So we reluctantly left the bird, and I did just that. By 10:30 a.m., I had driven to New Hampshire and back, got reacquainted with an old friend and saw my first-ever great gray owl. The great gray owl is a large bird of the boreal forest. Irruptions into New England are not as common as snowy owl irruptions, but occasionally one will show up in the region. This seems to be a good year for great gray owls, as I’ve heard of sightings in Maine, upper New York and Quebec. The Newport owl was just too much for me to resist. Check the ABA Rare Bird Alert for updates on the owl: birding.aba.org. 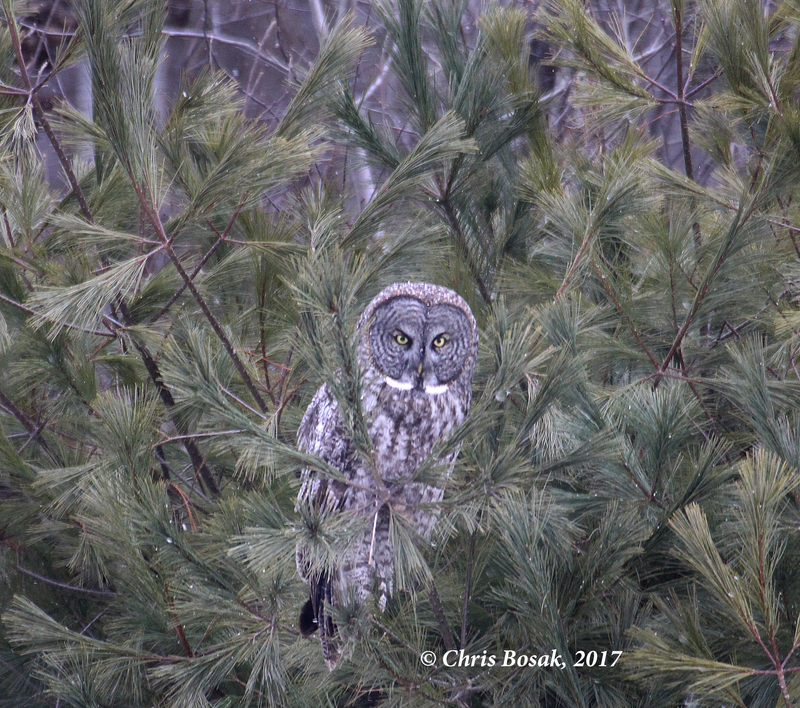 This entry was posted in For the Birds column, Owls and tagged chris bosak's for the birds, Great Gray Owl, Great Gray Owl Newport N.H. by Chris Bosak. Bookmark the permalink. What a story! As an amateur bird watcher, I know that envy!!! Great shot!